A hundred times a day I remind myself that my inner and outer life depend on the labors of other people, living and dead, and that I must exert myself in order to give in the full measure I have received and am still receiving. To a man who lives unto God nothing is secular, everything is sacred. He puts on his workday garment and it is a vestment to him. He sits down to his meal and it is a sacrament. 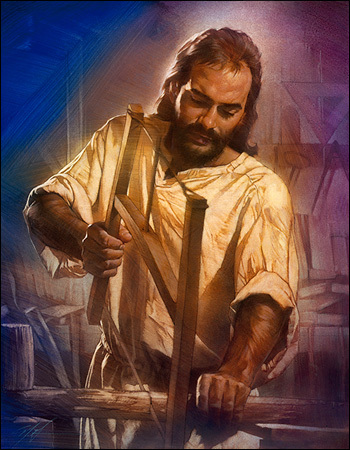 He goes forth to his labor, and therein exercises the office of the priesthood. His breath is incense and his life a sacrifice. He sleeps on the bosom of God, and lives and moves in the divine presence. Peter saw a sheet let down from heaven in which were all manner of beasts and four-footed creatures, which he was bidden to kill and eat, and when he refused because they were unclean, he was rebuked by a voice from heaven, saying, “What God hath cleansed that call not thou common” [Acts 10:15; 11:9]. The Lord hath cleansed your houses, he has cleansed your bed chambers, your tables… He has made the common pots and pans of your kitchens to be as the bowls before the altar – if you know what you are and live according to your high calling. You housemaids, you cooks, you nurses, you ploughmen, you housewives, you traders, you sailors, your labor is holy if you serve the Lord Christ in it, by living unto Him as you ought to live. The sacred has absorbed the secular. VOICE ONE: Almighty God, Maker of Heaven and Earth, you declared your work good and so do we. Empower us to continue your good work through the labor of our minds and hands. VOICE TWO: Gracious God, help all workers, especially those in authority over other workers, to carry themselves with honor and integrity. Keep them safe from harm and injustice. Provide the opportunities, benefits and pay needed to sustain them and their loved ones. Those who are looking for employment are invited to stand. Persons may also stand on behalf of a friend or loved one who is looking for employment. Those seated around them lay a hand of blessing and support on them for the remainder of the prayer. VOICE ONE: Strong and Merciful One, we also commend to your blessing and care those who are unemployed or underemployed. Guard them against discouragement and discrimination. Relieve them of worry and anxiety. Meet their needs for hearth and home and health. Come quickly with a fulfilling job with a trustworthy employer. VOICE TWO: God of Life, deliver us and all people from greed, corruption, and predatory business practices. Open eyes to sustainable and just solutions so workers of all nations will mutually prosper. Lead us as we work, so nothing we do is for self alone, but for the common good and for your glory. Click here for an excellent Labor Day Prayer by Steve Garnaas Holmes. For more information on the art and the use of this prayer in other settings, please refer to the copyright information page. VOICE ONE: Strong and Merciful One, we also commend to your blessing and care those who are unemployed or underemployed. Guard them from discouragement and discrimination. Relieve them of worry and anxiety. Meet their needs for hearth and home and health. Come quickly with a fulfilling job with a trustworthy employer.